What’s it like to see Hollywood stars enact your masterpiece? What does it take to get your script on screen? Dave is the mastermind screenwriter behind Authors Anonymous, starring Kaley Cuoco and Dennis Farina. In this interview, Dave pulls back the curtain, revealing the successes and heartbreaks behind the life of a major motion picture screenwriter. He shares what it’s like to brush shoulders with celebrities and see your name in Hollywood headlines. But fairytale success and heartbreak go hand in hand. And sooner or later, that fairytale ball must end. Of course, a go-getter like David Congalton has a solution for that too. Find out what it is below then tell me, wouldn’t you do the same? And don’t forget! 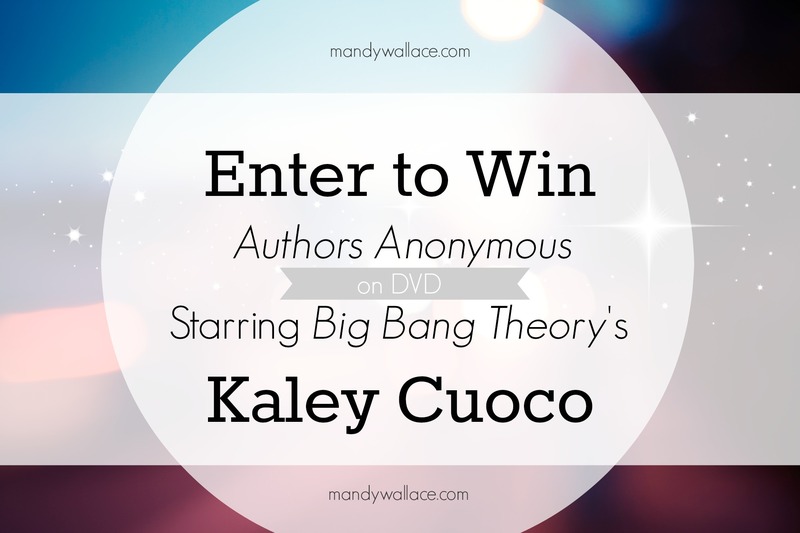 You can enter to win your own copy of Dave’s realized dream, Authors Anonymous, on DVD. See instructions below. The success I’ve enjoyed so far in Hollywood stems directly from (1) good writing and (2) networking. You need to excel at both. Mandy: What do you say to budding screenwriters who have a script but aren’t sure what to do next? What’s the secret to getting your script on screen? Dave: Writing a script is only half the job. The other half is getting it read, especially by the right people. I don’t have an agent, so I have to network on my own and try to make connections. 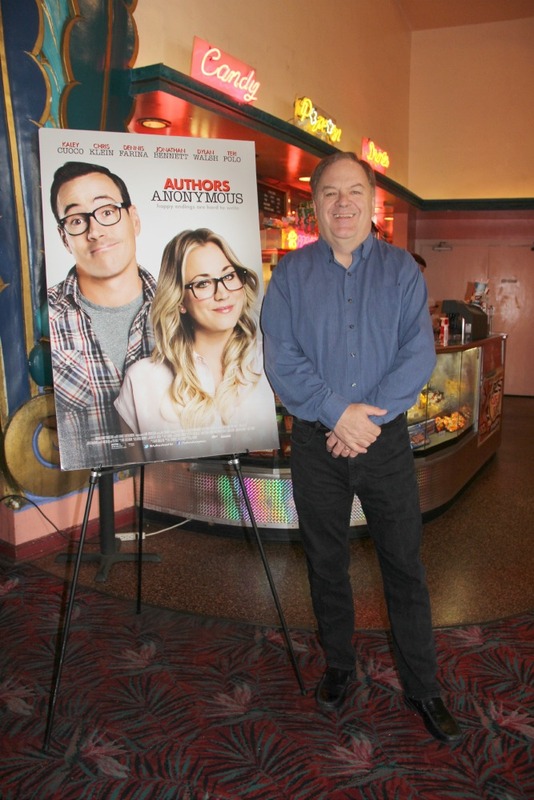 In the case of Authors Anonymous, I met a LA casting director at our local film festival. She agreed to read the script, loved it, and essentially became my gateway to Hollywood. That’s how our director first got the script—through a personal connection. The “gatekeeper” can be anyone who knows someone who has a friend, etc. I always tell writers that once they have a completed screenplay to announce it to the world because you never know who knows someone in the industry. The Seven Sisters script got optioned because I met a producer on the set of Authors Anonymous and she was looking for her next project. The success I’ve enjoyed so far in Hollywood stems directly from (1) good writing and (2) networking. You need to excel at both. You just keep writing and, sooner or later, you find your own voice. Mandy: Before pitching your script to a star like Kaley Cuoco, it has to dazzle. What is your secret recipe behind a dazzling script like Authors Anonymous? Where did you learn the art of storytelling? Dave: To write movies, you have to watch movies. And not just good movies. You have to suffer through some of the bad ones, as well, to recognize what went wrong. I read my writing aloud. That is critical to me. It’s the only way I can tell if the rhythm is working, if the dialogue is bloated or crackling. Also, I am vicious and uncompromising in the rewriting phase—every word, every line, has to justify its existence. If it doesn’t advance the story, it’s gone. Period. I also have studied scripts by downloading free ones from IMSDb and Drew’s Script-O-Rama. By all means, read books like Save the Cat or the original Screenplay by the late Syd Field. Pay particular attention to the writing of Alexander Payne. But also remember that Authors Anonymous was my eighth spec script. I wrote some real crap over the years, stuff I wouldn’t show anyone. You just keep writing and, sooner or later, you find your own voice. Because of my severe ADD, I have to write quickly in order to maintain focus. I am easily distracted. Mandy: How do you, Dave Congalton, go from idea to screen-ready script? Care to give us a little sneak peek at your process? Dave: If I’m not writing, I’m thinking about my writing. I have a notebook with about fifty ideas for screenplays, some obviously better than others. On my computer, I probably have about a dozen partial scripts, ranging anywhere in length from four to forty pages. I tend to abandon those other partial scripts because I don’t outline in advance, and I get trapped in the infamous Act II. I’m great at premises and set-ups, not so great at execution. Both Authors Anonymous and Seven Sisters were easy to do because they were so personal to me. No one gets to read anything by me until I have a rough first draft. Typically, my wife will read it first and then I’ll share with a couple of writing friends. However, I like to write and see where the characters take me. Both of the scripts I’ve sold have changed radically over the years from that first draft. Mandy: What happened after you sold Authors Anonymous? There was more work to do, wasn’t there? Dave: The director, Ellie Kanner, and I spent considerable time rewriting and revising the script, but once it was ready, they were done with me. I had nothing to do with casting decisions or fundraising or location scouting. Ellie was nice enough to keep me in the loop as we progressed and invited me to be on the set, which is rare. Writers don’t usually get to be on set, so I felt especially fortunate. Mandy: So the screenwriter has no say in the movie once he sells the script? That was definitely true for Authors Anonymous, right? I understand some of the characters changed, dramatic moments got lost, and some of the literary allusions disappeared. Can you tell me more about the differences between the script and the film? Dave: The biggest deviation from the script was the decision not to shoot the film one hundred percent as a mockumentary. In terms of the actual script, the major change comes in cutting back on the subtext of F. Scott Fitzgerald in the movie. He really was the inspiration for my script, and my story focuses much more on Henry. You also have to contend with actors who like to improvise dialogue. About eighty-five percent of the dialogue in Authors Anonymous was written by me, but the actors, especially Teri Polo liked to try a few spontaneous ideas. Most of the time, it worked. Sometimes, it didn’t. However, there’s really nothing the writer can do. It’s just part of the experience. If you don’t compromise, well, the producer can always opt to replace you. You learn to let go, as painful as that can be. Mandy: Was it worth those losses to get your work on screen? What would you say to fledgling writers out there who are afraid to release their work into the world for fear of losing it? Dave: Here’s Screenwriting 101 — If you’re a screenwriter, you have to remember two key words: compromise and collaboration. Once your script is sold or optioned, you are now part of a team and you have to learn to be flexible and be willing to alter the script. The director, the producer, the actors, and the crew are all going to bring up issues that will require changes to the story. Just keep telling yourself, I got a movie made. The joy is discovering that other people finally are seeing me the way I’ve seen myself for years. Mandy: Fear of losing your story is only one way writers can get stuck. Writers block is another. Even your character, Henry (played by actor, Chris Klein) struggled with writers block. You must have experienced it to write the character so well. How did you quiet those fears long enough to breathe life into Authors Anonymous? Dave: No, the opposite has been true with both Authors Anonymous and Seven Sisters. Both of these stories are drawn from personal experience and both came flowing out onto the page. One of the reasons for my success is that I fully believed in both stories. Forgive the trite phrase, but they’re from the heart. I never doubted myself for a minute. I’ve never doubted either one of these scripts. The joy is discovering that other people finally are seeing me the way I’ve seen myself for years. It’s an absolutely wonderful feeling to have those emotions validated by people in Hollywood. Mandy: Writing is a competitive career to break into. But one of the perks so many rely on is that age doesn’t matter in writing. The older you are, the more experience you have to write from. Yet you chose to write in a genre (screenwriting) where that maxim isn’t true. You’ve said that age does matter in Hollywood, even for scriptwriters. Yet you still nailed it. What do you have to say to those who feel it’s too late in the game to chase their dreams? Dave: I’m sure there are other examples of a writer over fifty selling his or her first script to Hollywood. There are producers who will option or buy a script from an 85-year-old, if the script is good and appeals to the market. It can be done. Age need not preclude success, but if you’re over fifty, the journey is going to be more challenging. That’s the sad truth. Having a screenplay produced is an absolutely amazing experience, but it’s also a bit like Cinderella at the ball. I didn’t want to leave LA. I didn’t want the ball to end. Mandy: After this whirlwind experience what’s the one thing you wish people asked you about your Authors Anonymous success, but they never do? Dave: Here’s a nugget I’ve never shared. Having a screenplay produced is an absolutely amazing experience, but it’s also a bit like Cinderella at the ball. Sooner or later, the clock strikes midnight, and everything comes to an end. For three weeks in August 2012, I lived my dream—I was on a movie set, watching the likes of Kaley Cuoco and Dennis Farina act out my scenes, my words. Folks on the crew consistently praised my script—it was difficult not to have a swelled head. On our final day in Los Angeles, we had a cast and crew party at a Hollywood nightclub. Deadline: Hollywood carried an announcement of the film, listing me as the writer. I was finally at the ball. But the next morning, it was all over. I had to get in my car and drive home and go back to my other life. I was deeply depressed for about two weeks because I didn’t want to leave LA. I didn’t want the ball to end. Mandy: Thanks for stopping by, Dave! But you can get an extra chance to win if you mention this interview on Twitter or Facebook. Make sure to link to the interview, then let me know where I can see your shoutout. The winner will be announced on 22 September 2014. So entrants keep an eye on your inbox! Sold my dvd player on ebay. Owned it 12 years but only used it about 5 times.